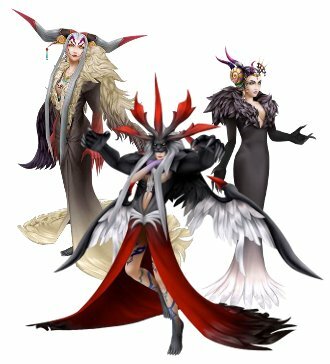 Ultimecia (アルティミシア [ultimecia] in Japanese) is the main opponent in Final Fantasy VIII. She is a witch from generations ahead of the game's present time, one who has gathered all the hereditary witch powers and is thus the last witch in the world and at the same time the most powerful one who ever lived. In the original game Ultimecia's seiyuu is unknown (she has a brief appearance as a laugh at the start of the final battle). In Dissidia and Duodecim it is Atsuko Tanaka for the Japanese version and Tasia Valenza for the English one. As mentioned previously, nothing much is known about Ultimecia's life, not even the exact time period she comes from. However, somewhere during her life she developed a hatred of humanity, so much so that she eventually decided to achieve time compression, a state in which all time exists at once. Due to her powers she would be the only one able to live in such a world, and thus would be rid of her source of hatred. 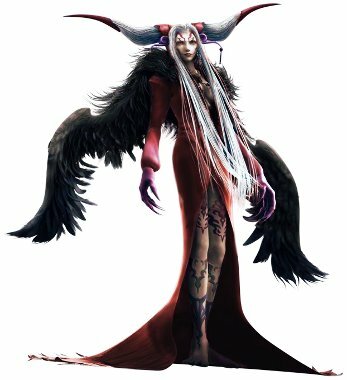 It is unknown what exactly transpired in Ultimecia's own time period prior to meeting her in FF8, but it is apparent she has been fighting at least SeeD of her time, possibly also other humans - if there were any left in her recent past. At some unknown point in her life she also either built or otherwise acquired her castle. It is unknown if it was capable of flying/floating at the time she got it (if indeed she got it and didn't make it) or if she did this herself. Nevertheless, the castle is floating and anchored by where Edea's house used to stand, at the south-western edges of the fragmented Centra continent. ""Find the legendary Lunatic Pandora, said to be hidden beneath the ocean. Only then shall the sorceress provide you with dreams again." "…SeeD… SeeD……SeeD…… SeeD, SeeD, SeeD! Kurse all SeeDs. Swarming like lokusts akross generations. You disgust me." "I am Ultimecia. Time shall compress… …All existence denied." -Ultimecia, about to be at her most powerful. 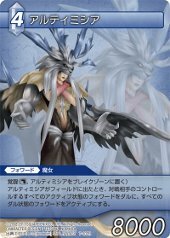 Ultimecia has appeared twice in the FF-TCG, under the element of Water. There is some indication that the original spelling of Ultimecia's name was supposed to be Ultimisia, a combination of 'ultimate' and 'Artemisia', a Greek name derived from the name of the goddess Artemis. She is associated with the moon, hunting, and virginity.